Choosing new or replacement fencing for your home or business can be overwhelming. As well as style, size, suitability and finish, high-quality fitting is essential. James Grove Ltd are experienced professionals, creating durable, well-built, cost-effective solutions for home, garden and business. If you need fencing and gates in Worcestershire and the West Midlands, we can help. We’ll help you choose the right fencing solution for your space and budget. We can provide and install a range of options suited to your needs. Using professionals will avoid any costly mistakes and result in the best product being used for the job. You may be simply replacing a broken panel or completely transforming your garden. Panel fencing provides privacy and security for your space. 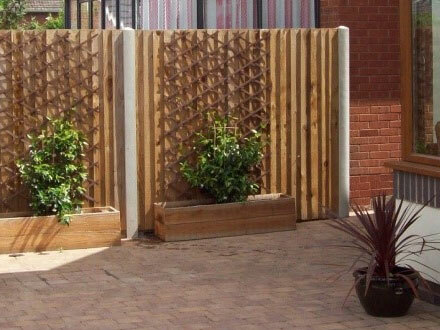 We can supply and install a range of fence panels, all in assorted sizes and styles to suit your needs. With its timeless appearance and robust qualities, feather board is used to provide a smart, protective perimeter around your garden. Available in a range of heights and styles, this solid fence panel is used widely across the UK. For a traditional look, palisade fencing provides privacy and security without blocking the view of your garden. Gaps between posts allow light to come through, as well as providing lines of sight. Like a picket fence, this style suits a range of settings and always looks attractive once installed. Typically used in rural and agricultural settings, this traditional style of fencing is versatile and attractive. It acts as a visual deterrent, a perimeter for paddocks and to restrict livestock movement, also making your property boundaries clearly visible with an interesting finish. If you have an idea in mind or need to match existing fencing and gates, we can provide bespoke solutions. Contact us to discuss your needs and receive a no-obligation quote. Essential in general farm maintenance, correctly sized and installed stock fencing will keep your livestock secure. Let James Groves’ team of professionals give you peace of mind with the highest standard of workmanship. Your gate needs to fit well and provide easy access for you, as well as security for your home or business. We can help you choose the right product to fit the style of your fencing and your security needs. As a family run business with 40 years’ experience, James Grove Ltd provide exceptional customer service and workmanship. Our fast, reliable and friendly service will leave you with long-lasting results enhancing your farm, garden, country estate or business premises. All our clients are protected by our £2.5 million public liability insurance for your complete peace of mind and all our professional staff are compliant with current Health and Safety regulations. For the perfect fencing solution and the highest standard of service, Give us a call on 01905 754 296 / 07768 034 323 today. Or, email info@james-grove.co.uk for a free, no-obligation quote.